Today in 1957, the Ford Motor Company introduced perhaps the greatest financial failure in automotive history—The Edsel. The company decided to name the fiasco after Edsel B. Ford, son of the company’s founder, Henry. Edsel unfortunately had no say in the decision, as he had died fourteen years earlier in 1943. The Edsel was developed under the name “E-car” or “experimental car” and was launched exactly fifty-three years ago (September 4, 1957) on “E-Day.” Part of its experimental design featured a “Push-Button Teletouch” transmission system located in the middle of the steering wheel—precisely where most cars of the period placed the horn—that led some drivers to shift gears unintentionally when they merely intended to honk. The cars also featured an unusual front grill described variously as “an Oldsmobile sucking a lemon,” “a Pontiac pushing a toilet seat,” and "the opposite of phallic." 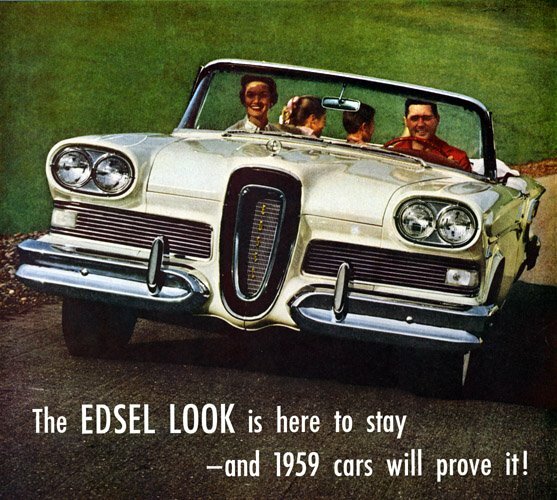 The launch of the Edsel now serves as a case study for how not to market a new product, and the name has become synonymous with any fantastic business failure. But it is likely the car’s namesake—Edsel Bryant Ford—who has suffered the most. At the height of its unpopularity, the Edsel name was repurposed as an acronym—Every Day Something Else Leaks.